When there is a job for Lab Fairy it doesn't matter whether it's in the Noth or in the South - Lab Fairy packs its tools and embarks for an assignment! This time Lab Fairy has got a call from Ben-Gurion University of the Negev. Having boarded a train heading South, the Lab Fairy had an hour ride to Beer Sheva. 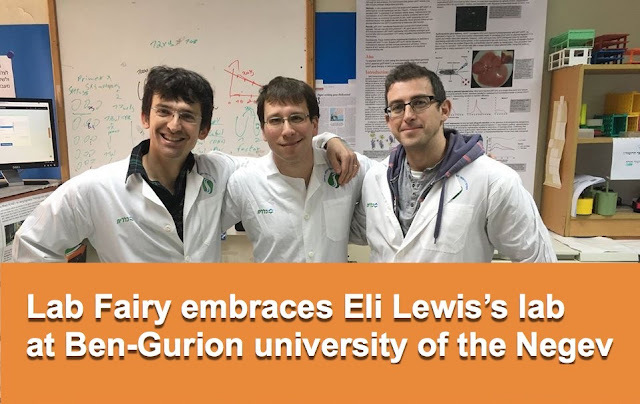 At the campus which is shared by hospital and university, Lab Fairy was met by amazing lab manager - Ronen Schuster. Ronen was so positive and cooperative that Lab Fairy had a true pleasure of working with him. 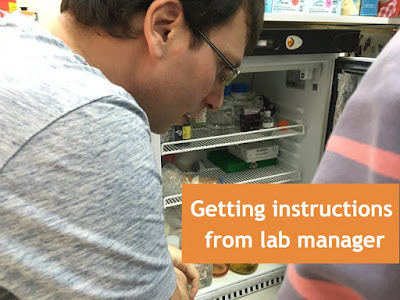 Ronen accompanied us to the lab and gave very accurate instructions, so the expectations on both sides were very clear. Lab Fairy plunged into work. Lab Fairy's target was a fridge full of antibodies. On previous Lab Fairy assignments, there were containers mostly with chemicals, therefore dealing with the new type of inventory items made it even more interesting and exciting! One of the things that I found most fascinating about Lab Fairy is how lab managers perceive and talk about Lab Fairy. While all share the same goal of having a more organized lab, many are motivated by different pains. For example, Ronen got extremely excited that owing to Lab Fairy he could have more free time. With this extra time, he could go to another professional meeting, without sacrificing his lab into logistic chaos. These tiny antibody bottles were labeled by solvent-resistant labeling stickers and got checked in into LabSuit inventory module. Though Ronen was busy with his tasks, the atmosphere was extremely positive, and I would like to thank both Ronen and Eli for that! I wish there were more labs like this one! See you next time at Ben-Gurion University of the Negev! An impressive blog has an impressive post. your topic is very unique and informative for people related to lab field. BitxFunding is your online business marketplace. Have you ever gone through the AOL mail login problems? this problem can be due to the several reasons. visit askprob community to get your problem resolved. Have you ever gone through the aol mail not receiving emails problem. this problem can be due to the several reasons. visit askprob to get your problem resolved. If you are face technical issuse apple id reset with our my apple id password forgot and other such errors. user can get help apple id password reset of highly qualified technical experts by calling our toll free support phone number 1-800-436-6070.
Who is a lab fairy?